We just finished working through a poetry unit in the literature plans of Tapestry of Grace Year 4. I do so love the flexibility we have with TOG and picking and choosing which parts to use this year as part of our Modern History and Literature plans. We are a family that enjoys the buffet of choices that Tapestry of Grace offers, a framework and a solid ground to build from. I don’t feel tied to it, yet when I stick with it I see its beauty. We are seriously winding down our school year, finishing writing projects, literature and history reads, artist and composer studies, and several of our DVD courses. It has been such a wonderful half-speed year for Mr. B and we are both so glad that we decided to split his senior year into two. I see him maturing in his thinking and his goal making. He has enjoyed the pace and the room for going deep where he has found interest. The star of the week really was the poetry study and if you are using Tapestry of Grace I highly recommend using the book they suggest, “The Poetry Anthology, 1912-2002” edited by Joseph Parisi and Stephen Young. We used the list of around 15 poems in the TOG plans as a starting spot and then Mr. B used some my Poetry Analysis notebook pages to pick a few things to respond to for each poem. I love this open ended kind of assignment and so does he since he can share his thoughts in a way that makes sense to him. 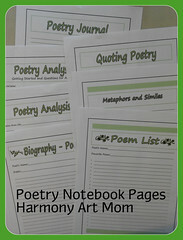 You can find all my poetry pages and lesson plans on Squidoo: Poetry Notebooking Pages. We only have two weeks of school planned and then soon after that a BIG trip to New York! We are going to be doing some exciting things, including a trip to the Metropolitan Museum of Art (hoping to view this exhibit) which Mr. B and I have dreamed of doing for a very long time. We are preparing a list of things we must see while we are there and I will be sure to share all about it when we get back. 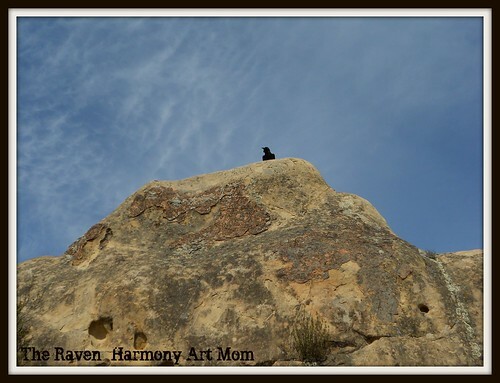 Link up with your Weekly Wrap-Up post at Weird Unsocialized Homeschoolers. My latest review is posted over on The Curriculum Choice: IEW Excellence in Literature. Mr. B has used this all year as part of his literature and writing courses. Click over and read more in detail. Poetry is about the business of words and picking just the right words to match the tone and mood of the subject. The words in a poem are what bring it to life. 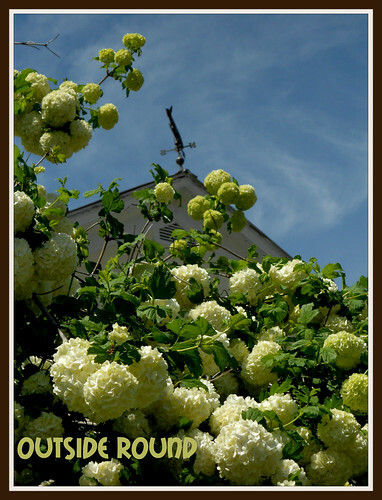 Collecting words and arranging them in just the right way is what makes a great poem. I think this is what I appreciate about Mr. B the most lately. He is reading so many great classic books as part of his homeschool and in his free time as well. He often comments that he wishes people would still talk like the characters in these books. The richness of the words is enjoyable to him. I see him using those words in his writing and hear them in his speech. Great literature and poetry are like that….they seep into your brain and into your heart….sometimes even giving us a bit of a thrill. Offering a healthy heap of poetry alongside regular high school literature will enhance your study of words. Poetry is like art with words and like art, tastes will vary. We will not like every poet so I try to offer a variety of styles and voices as a way to expose my boys to new ways of expression. Honestly, they do not always enjoy it as much as I do. But, it is like everything else and we must take a nibble of a poet in order to know if we like them or not. Nibble a taste of Edgar Allen Poe’s: The Raven on YouTube.com. Langston Hughes, Edgar Allan Poe, Robert Frost, Rudyard Kipling, Longfellow, Tennyson. My Review of IEW’s Poetry Memorization program (all ages). Along the way, I decided to make a fresh set of notebooking pages for him to use with the lesson ideas. Nothing fancy or complicated (remember this series was Poetry for High School Boys) but still nice enough to merit being called “poetry notebooking pages”. I share those pages with you now. 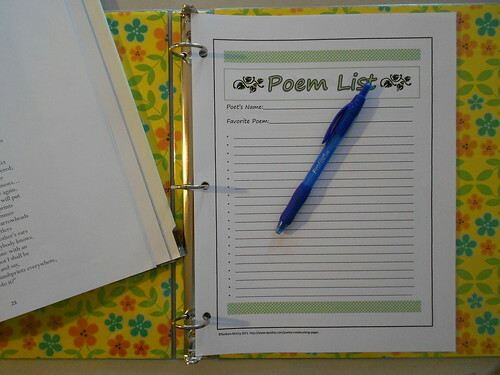 Includes 6 notebook pages and one additional page explaining how to get started with poetry analysis and a list of question. I probably will make a few more pages and add them to this page before our year is over so make sure to bookmark and save this page for future reference.You can see images of each page over on Squidoo as well.